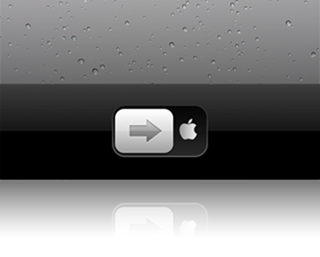 Apple’s "Slide To Unlock" mechanism is one of the most iconic features of its mobile operating system, iOS. Even though the fruit company was only fairly recently granted the patent for the omni-present lock screen function, those familiar with iDevices will recognize it as the very first thing they interact with when picking up their iPhone, iPad, or iPod touch. The developers behind the Cydia store leave no stone unturned in their ongoing quest to make the iOS experience more functional, productive, and generally better for all. The slider, while not necessarily in need of much in terms of modification, is still not exempt from a tweak or two, and SliderWidth by developer ravirajm allows you to widen the reach of that most famous of arrows. Compatible with iPhone, iPad and iPod touch, the tweak is quite obviously intended mainly for the larger, tablet device. While the slider is kept to a minimum on the 9.7-inch display at stock level – presumably in order to save time – there’s something a tad bit pathetic about sliding over only a fraction of the iPad’s gigantic display in order to initiate the home screen. Never fear, SliderWidth will give you the option of increasing (or indeed, decreasing) the width of your slider, and to complete the tweak rather nicely, you can also add your own custom text to the slider as opposed to the monotonous (and, if read another way, rather patronizing) "Slide To Unlock" reminder. This tweak will work amicably alongside Springtomize 2, provided you haven’t altered the slider in any way. If you have, then you may see some unwanted and unsightly overlapping. 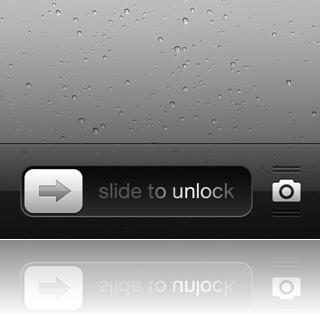 SliderWidth will also allow you to lock the camera button in iOS 5.0/5.0.1, although from a visual perspective, it will affect the evenness of the slider in general. 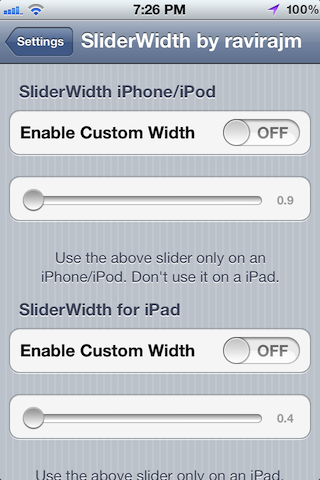 SliderWidth can be obtained via the ModMyi repository, and is absolutely free of charge.